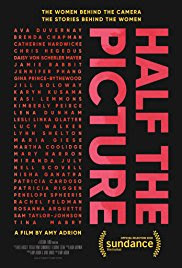 Kate Raphael speaks with Amy Adrion about her documentary HALF THE PICTURE, which screens at the San Francisco International Film Festival April 7, 9 and 16. Adrion interviews a diverse group of women filmmakers including Ava DuVernay (Selma), Gina Prince-Bythewood (Love & Basketball), Jill Soloway (Transparent), Lena Dunham (Girls) and Karen Kusama (Girlfight). Women make up only 4.5% of directors of top grossing Hollywood films annually; women of color make up 0.06%; and these numbers have not changed in twenty years. Director Amy Adrion is expected to attend the April 7 and 9 screenings. April 9 screening is a special collaboration with additional guests. Following the April 9 screening, the Festival will present an extended conversation about building a pipeline towards gender equity in the film and media industry, featuring director Amy Adrion from Half the Picture and Esther Pearl, Founder & Executive Director of Camp Reel Stories - A Media Camp for Girls.